The 5-Day Health Camp is a gentle but effective program designed to address these and other problems via a comprehensive approach to restoring health through adherence to nature's laws. What are you waiting for? Come and feel the good vibrations that will "do your heart good like a medicine" Proverbs 17:22. Music on the house at Eden Pointe with refreshments! 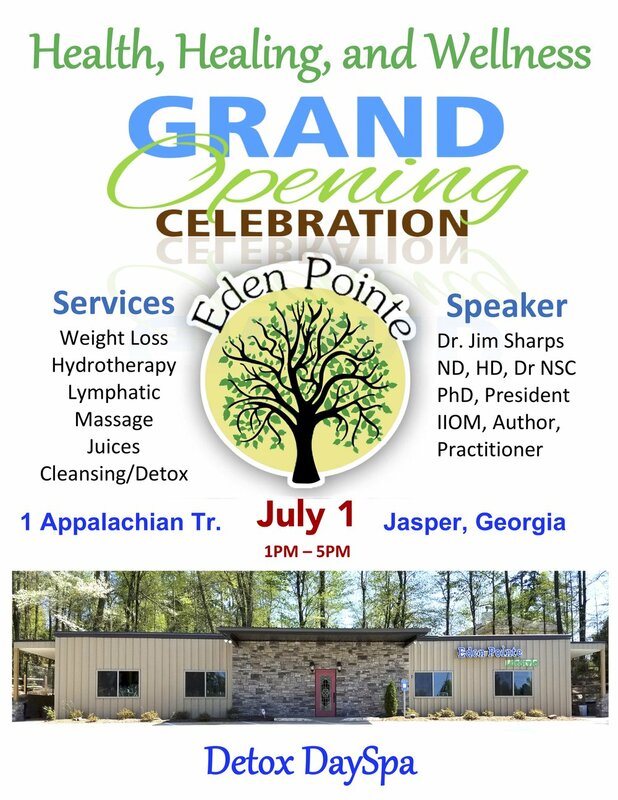 1 Appalachian Trail, Jasper, Georgia Call 706-253-2940 Come sample the life changing experience of Eden Pointe Lifestyle. Refreshments and samples. Join our HIIT instructors for the 30 minute total body workout. 5 station rotation and herbal tea cooler $10. Secrets of sprouting for maximum nutrition. $10 to seat and eat. Soy yogart and sour cream. 3 simple ways to can the cow. Free samples. How to make no fat oat waffles. $10 per seat and eat.